More than 60 percent of the total population of New Orleans is African American. Twenty-seven percent of its citizens live below the poverty line. Though public monuments and spaces representing the history of oppression remain throughout the city, many community activists are connecting with residents through art, architecture, education, and land development to bring justice through a change in design. By improving community engagement and crowd-sourced ideas and input, the city will become more innovative and culturally relevant to the people who make up its community, local stakeholders say. The city of New Orleans, the Arts Council and community groups are addressing the idea of design justice through a variety of innovative projects. One of this year’s SXSW Social Good Hub speakers, Bryan C. Lee Jr., shared his vision of design justice in New Orleans and the numerous projects supporting social change. Let’s explore six of the projects involving citizens, nonprofits and government working to create a better New Orleans. Since 1986, New Orleans dedicated 1 percent of municipal bonds and capital projects for the arts. But this process isn't allocating funds at the most effective level, Lee Jr. said. Presently, only 20 percent of the bonds are eligible for this program. Most of the funds maintain existing projects rather than funding newer ideas. The Arts Council is working with the city to try to change how the program is funded and operated. Art and civic design programs -- to implement intervention throughout the city by creating a positive impact in communities -- are not presently receiving the attention they need. If additional funding can be procured, new projects plan to address issues of access, such as public Wi-Fi. This funding program is also looking at ways to address social conditions such as food justice, criminal justice, and fitness space. From billboards to yard signs and bumper stickers, New Orleans citizens are communicating through signage about fair housing projects within the community. Blightsout.org is a group of artists, citizen activists and community members who work together to use ‘design as protest.' You too can order yard signs to show your support for their mission to bring affordable housing to blighted areas using a new model of not-for-profit development. These statements call on people to be active participants in housing justice.“Citizen architects exist beyond our silos,” Lee Jr. said. 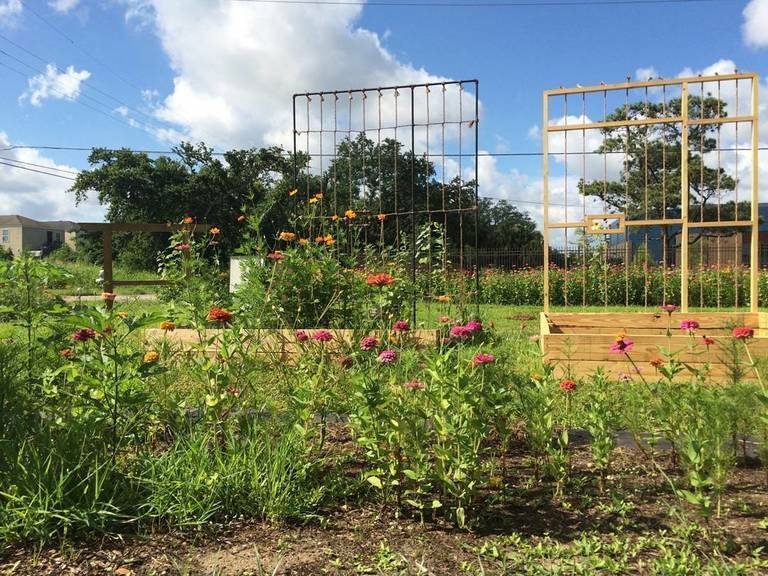 Solitary gardens is a public space representing views against solitary confinement. The garden's creator, Jackie Summell, said the way we imprison citizens in the U.S. represents "slavery’s evolution into the prison system." By creating an attractive, interactive green space representing the dimensions of a jail cell, one can imagine the transformation if our society concentrated on relieving issues of poverty like resolving hunger, creating safe housing, and funding education. This seems a simple matter, but it actually appears to have become a dangerous endeavor. Lee Jr. said New Orleans is working to remove the many statues representing inequality. These monuments have been debated and fought over in court for over 40 years. Federal courts finally agreed that the city could do what it wanted with its statues, which include monuments to Confederate leaders such as Robert E. Lee. Statues the city plans to remove include an obelisk, known as the Liberty monument, which represents white supremacist history. The statue was also used as a meeting place for David Duke and the KKK to conduct hate rallies. The issue with removing the monument is fraught with difficulties as the original contractor set to remove the statue received death threats and destruction to his property. In order to remove this particular monument, contractors asked to remain anonymous and do the work at night. It’s unfortunate that the removal of something that represents oppression and violence still causes this type of threatening, hateful behavior. But advocates are still pushing for the change. XQ is a nonprofit that promotes innovative learning concepts, while striving to connect students to their community and environment as part of a creative education. The winner of a school-specific innovative design competition wins funds and support to implement their project. New Orleans’ concept for the New Harmony School won, and they’re set to open as a pilot space this fall while the final school concept is worked through. The New Harmony School is planning to accommodate 130 students and will open its ‘floating barge’ school in 2018. The concept of floating down the Mississippi was developed as an equitable application process so high-schoolers from the surrounding areas can apply. Financing and collaborative partners include Concordia, Cowen institute at Tulane, and Big Class. The XQ Super School Project hopes to change the way education works by encouraging an innovative multi-disciplinary curriculum in new types of spaces. Lee, Jr. said the number of times the city requires community projects to be reviewed via community meeting will soon increase from one to 10. He hopes this new rule can increase citizen involvement in the city's programming and conceptual design process. By including the community early, citizens can share their vision of their community needs. The Arts Council will run community engagement meetings, a model they're now testing with the Claiborne Market project. This project is located under the 610 Highway/Claiborne Bridge, and Lee Jr. says it can provide a “cultural and artistic market corridor with art, clothing, food, education space, and outdoor theater” depending on what the neighborhood might need. On the local level, protests and community action show how citizens are taking on greater responsibility within local communities to create a more equitable, fair, democratic and just society. It’s inspiring to see how these types of progressive programs integrate the idea of social justice in New Orleans. Involved citizens will bring about the changes that help people thrive.